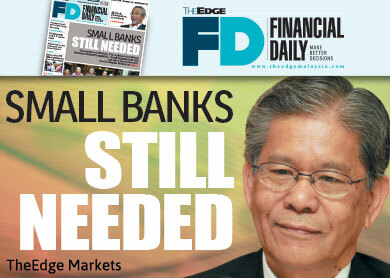 KUALA LUMPUR: Malaysia still needs small banks like Affin Holdings Bhd to serve niche markets, said its deputy chairman and non-executive director Tan Sri Lodin Wok Kamaruddin. A merger is in the works among CIMB Group Holdings Bhd, RHB Capital Bhd and Malaysia Building Society Bhd to create the country’s biggest banking group, which may spur further consolidation in the local banking sector. Lodin, who is also group managing director of Boustead Holdings Bhd, said, however, the proposed merger is not expected to have an impact on Affin, the country’s smallest banking group by market value. “I don’t think the mega bank merger will have an impact on us. Malaysia still needs small banks like us (Affin) because we focus on a niche market,” he told The Edge Financial Daily after giving a presentation at icapital.biz Bhd’s 2014 Investor Day on Oct 12. Affin’s market capitalisation stood at RM6.28 billion as at last Friday. Its closest rival Allince Financial Group Bhd’s market capitalisation was RM7.51 billion. Boustead, which is 56.95% owned by Lembaga Tabung Angkatan Tentera (LTAT), is the third-largest shareholder of Affin, with a 15.92% stake. LTAT owns a lion’s share of 35.18% in Affin directly. Lodin said the recent acquisition of HwangDBS Investment Bank Bhd by Affin proved that the latter wants to remain relevant in the market. “We are in a good position to remain as one of the players in the investment banking market. We have been in the market for the last 30 to 40 years. We have good people managing the operations,” he said. In April this year, Affin completed the purchase of HwangDBS (M) Bhd’s key assets for RM1.363 billion in an all-cash deal. Lodin said Affin, which has yet to expand its operations beyond Malaysian shores, is looking for opportunity to do so in Asean. “Asean will be a good platform from where we can start. Next year, the trade will be opened up among the Asean nations,” he said. Lodin said Affin does not discount the possibility of more mergers and acquisitions. “But it is not for me to answer this question. It is for the shareholders to answer that. It is a question of value, whether such kind of exercise can unlock the value or add value for the shareholders,” he said, adding that he is unaware of renewed rumours about local banking tycoon Tan Sri Quek Leng Chan’s Guoco Group looking at a merger between Hong Leong Bank Bhd and Affin Bank Bhd. “That’s news to me. I don’t know anything about it,” said Lodin. Back in 2009, it was reported that Guoco Group was busy accumulating shares in Bank of East Asia Ltd (BEA), the largest independent local bank in Hong Kong. BEA is presently the second-largest shareholder of Affin, with a 23.52% stake. Meanwhile, Lodin said Boustead may consider setting up a real estate investment trust (REIT) in the future. “It will not be so soon. We are not ready yet because our [current property] assets are not big enough. “We want to rationalise all our property activities, develop the assets and wait until they are profitable before we unlock value by establishing the REIT,” he said. If the move materialises, it will be Boustead’s second REIT. Affin privatised its plantation-based Al-Hadharah Boustead REIT in July last year, prior to listing an enlarged Boustead Plantations Bhd. Boustead, one of the largest and oldest conglomerates in Malaysia, has an active interest in six primary sectors namely plantation, property, pharmaceutical, heavy industries, trading and industrial, and finance and investment. On its plantation business, Lodin said Boustead Plantations is cautiously seeking opportunities in the region. “We will confine [our search] to just Asean first. Beyond that, we might go to Papua New Guinea. However, opening plantation overseas involves a number of challenges such as land acquisition, logistic cost, labour and soil suitability,” he said. At the group level, Lodin acknowledged that 2014 will be a challenging year for Boustead on weaker crude palm oil (CPO) prices and a slowing property market. “But not every year is going to be a bumper year. So you got to be efficient; you got to be cost-effective in your activities; you got to continue to review your cost. “Even though when there is a crisis, we will probably make less profit than previously, but still, we will remain profitable,” he said. Boustead’s net profit grew 14.9% to RM478.8 million for the financial year ended Dec 31, 2013 (FY13) from RM416.7 million, while revenue grew 14.1% to RM11.21 billion from RM9.82 billion a year ago. On the group’s pharmaceutical business, Lodin said Pharmaniaga Bhd plans to expand its business presence in Asean. “We are just in Indonesia, but there are market potentials in Thailand, Cambodia, Laos and Vietnam,” he said. Lodin also said Boustead may consider making a cash call, given its gearing of 1.3 times. “We have to review it. In the past, we relied quite heavily on bank borrowings to fund our activities. At the right time, I suppose, it may make sense for us to invite our shareholders to take up more shares in the group to increase our capital,” he added.